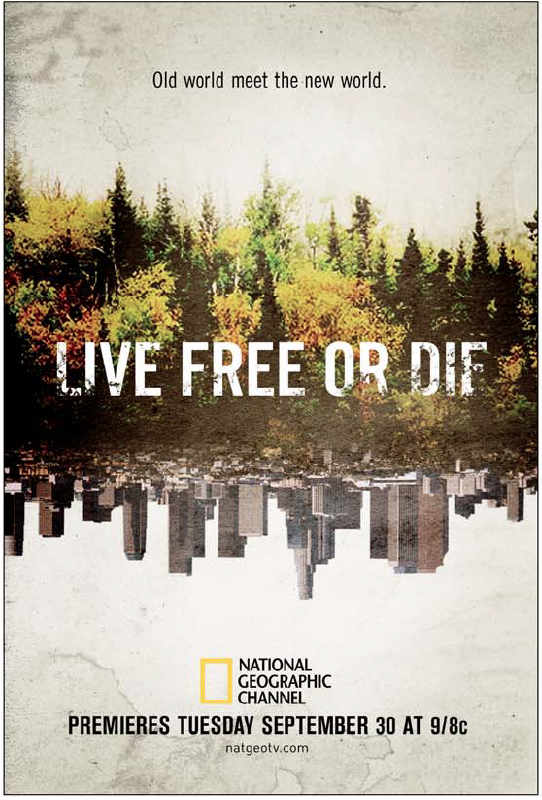 “You’re only as good as the team around you.” True words to be sure, and extremely relevant for this post, which will focus on the campaign behind “Live Free or Die” – a new National Geographic Channel series. It took a huge team of passionate and creative people to bring all of the elements of this campaign to life, with a large variety of different production specialists (edit, design, cinematography, art direction) contributing to that effort in different yet connected ways. This post will be a case study in a few key areas: 1) The marketing and positioning of a new show. 2) Injecting additional production value into a campaign stacked with top-notch production value already. 3) Assembling the right creative partners to bring it all together. Thanks as always for reading, sharing, and commenting if you enjoy the content. A big shout as always to my team at Nat Geo behind this campaign, including Executive Producer Erin Newsome, Creative Director Tyler Korba, and Creative Director of Design Brian Everett. Key Art for “Live Free or Die” by Cold Open. 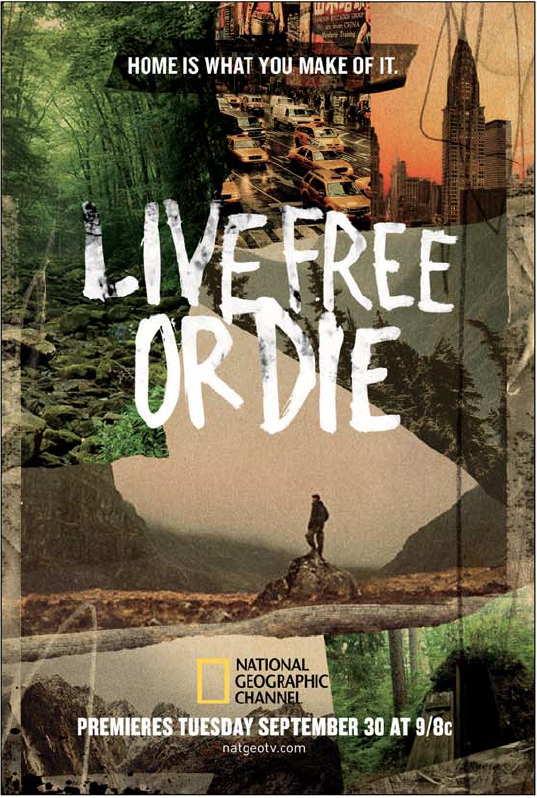 This September, Nat Geo launches a new series, called “Live Free or Die.” It focuses on telling the stories of 5 people living on their own terms, off the grid and disconnected from society. Based on an article one of our development Executives read about “re-wilding”, it is all about people who have decided to eschew the usual trappings of life (electricity, running water, salaries, offices, grocery stores) and live truly off the grid. They make their own shelter, tend their own gardens, hunt their own food, and live as simply as possible. As one cast member (named Thorn) puts it: “I was born about 16,000 years too late.” It’s a brand new series, so that always presents some unique challenges to not only sell the show, but also to introduce the concept to viewers. One of our first challenges was to figure out how we WOULD sell this show. At first blush, it could be looked at as a “Life Below Zero in the Lower 48.” After all, both sets of characters were isolated, hunted for their own food, and live life simply – and struggle to survive on their own terms. 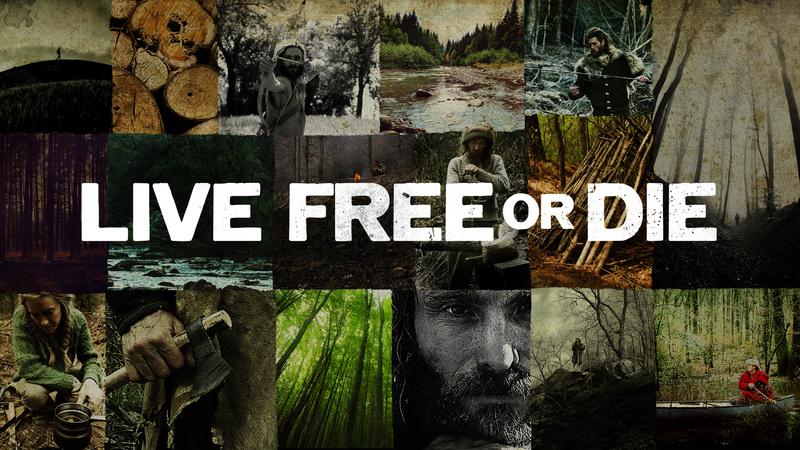 But after screening a few episodes, it was clear that Live Free or Die (LFOD) was something a little different. LFOD was not a life-or-death situation type of show. Yes, the characters could starve I suppose, but the icy-cold specter of death that always overhangs in Life Below Zero simply isn’t here. 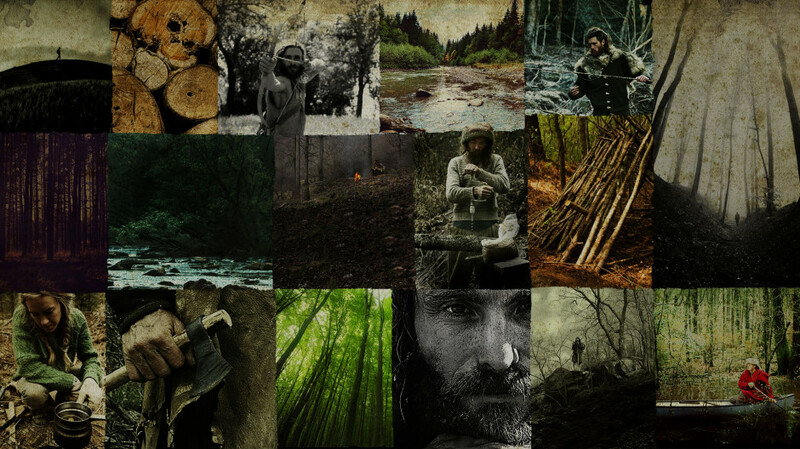 The characters in LFOD live in the forest, on a farm, in a swamp, and in the mountains. Harsh – yes, but hardly sub-zero. But what we found was that LFOD reveled in the smaller things. Building your own shelter. Harvesting rain water. Hunting for your dinner. 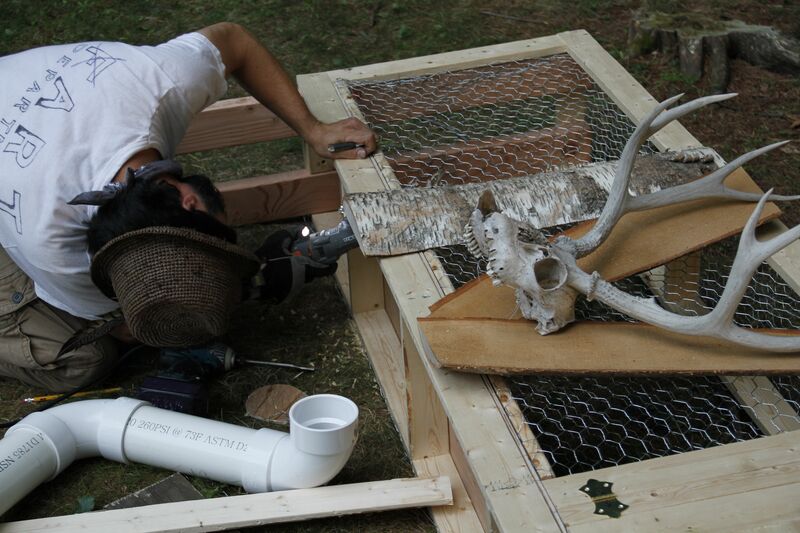 Raising rabbits. Planting your own food. Those small victories are sometimes more satisfying to watch, and the characters’ devotion to this lifestyle planted the seed that became the approach to selling this show: there was purpose behind this lifestyle. It wasn’t hippies in the forest – it was a conscious movement, and a dedication to live life on their own terms. To celebrate their choice, and their simple happiness was the way to make this feel bigger, more important, and ultimately feel more satisfying to the viewer. And going a step farther, when you look at this show, it does embody what the National Geographic brand is all about. It’s an in-depth, personal look at people you’d never normally come across, in a place you’d likely never visit…unless you maybe went camping nearby! It’s also beautifully shot – powerful, unique visuals are another key brand component so it lives up to that as well. And lastly – it’s authentic. These people would be doing exactly what you see, whether cameras are there or not. All of those factors make it feel like a perfect fit for our brand, and when those shows air, we want to hold them up just a bit higher for people to be aware of. At the time of publication, Ron Burgundy’s conch shell was being re-purposed as a water filtration system. Figuring out who to partner with was where it really got interesting. Once we had sort of settled in on this “movement” idea with our internal consumer strategy team, we looked at what we had to work with. Most episodes of the shows were already delivered – luckily for us, the show was beautifully shot by the team at National Geographic Television (and created by new NGC President Tim Pastore) – with not only great soundbites and cinematography, but also included drone shots and phantom macro shots. We knew that we wouldn’t need to go back out to the characters’ homes and re-shoot anything – and with them living all over the country, it wasn’t possible with our budget either. So it was clear that we needed to team up with some great editors to help assemble all of the shows into some compelling cuts. So we partnered with the editorial team at Ultrabland – a boutique promo shop in NYC that specializes in using show footage in clever and creative ways. They’ve done trailers for HBO, Cinemax, A&E, and FX among many other clients – and what’s special about them is that they don’t approach their edits the way everyone else might. They find new ways to slice and dice the footage they’re given and bring it to life in a whole new way. I realize that sounds pretty much like the definition of a great editor – and that’s what they bring. (You’d be surprised how rare and hard to find that is.) Another great benefit of Ultrabland is that they bring lots of ideas to the table. You won’t get 1 or 2 cuts in the rough cut stage – you’ll get 5 or 6 completely different drafts and approaches. But as I’ve stated in previous posts, our needs go beyond just a few hot launch spots. Networks need graphics packages for end pages and title cards, and supplemental footage to round out the campaign and find ways to make it feel big and special. When viewers see hundreds of promos for new shows, you want to make sure yours stands out a bit. So Erin had written some great scripts, and the edit team from Ultrabland was ready to start cutting. We called up our friends at Charlie Company to help us with graphics – titles, cards, and any animations that we would need in the course of our campaign. Part two of the LFOD “Dream Team” was complete. In many cases and on smaller projects, we might have stopped there. But in the effort to try and pull out the stops, the team had batted around a bigger idea. 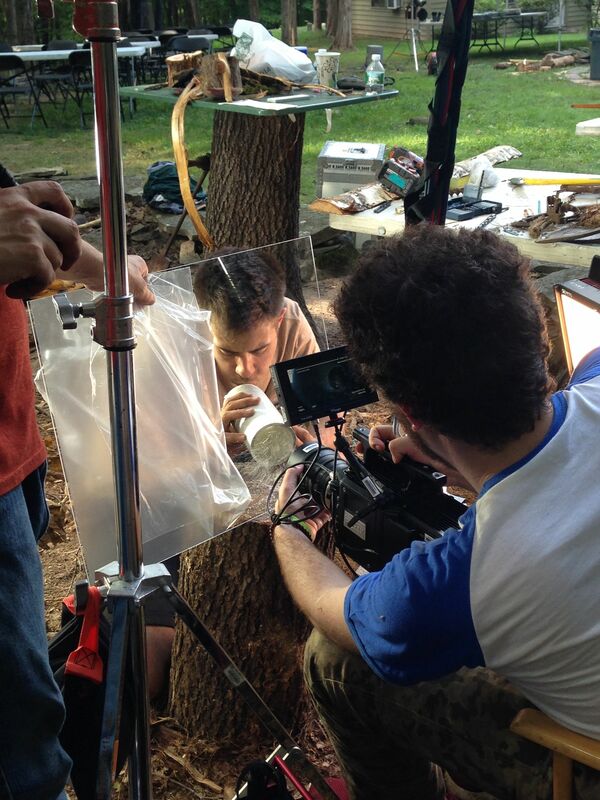 Director Jon Bregel of Variable gets up close with the Phantom and a PVC pipe during the logo shoot. Photo by Erin Newsome. What if we were to actually BUILD the logo for LFOD – and use materials that our characters might use themselves? The show has them sourcing old trash, unwanted materials, and stuff that most everyone else would want to throw away. But as one character, Tony, says in the show “You’re only limited by your imagination. You can create a paradise out of garbage if you’re imaginative enough.” We knew that the final piece of the puzzle could be to not just settle on a graphic end page for the spot, but in the spirit of the show – build one with our own hands. So we contacted our great friends at Variable, who have built some pretty crazy practical elements for us before, and despite a very short timeline, the wheels were in motion. We’d build a giant, practical version of the logo, and film it all – the plan to shoot tons of textural elements that could be used for graphic plates, or even create a full spot with those materials, and then finish the spot using the logo. And last but not least we would need key art. While the media buy wasn’t going to be huge for print and outdoor, it’s still a pretty standard deliverable for us to make art that can be used for posters, digital banners, and any print large or small. After our successful partnership on “Life Below Zero” we tapped the team at Cold Open to sketch out some concepts for key art. Our team was in place, and it was pretty exciting to get started. TAKEAWAY #1: IT STARTS WITH THE WORDS. We don’t have an axe to grind. Or a cross to bear. We just know that food tastes better with dirt on our hands. That fire burns hotter in a house we built. And that out here, we will…Live Free or Die. TAKEAWAY #2: GET RESOURCEFUL WITH THE PRINT. Rejected sketch concept for Live Free or Die. With no people or ‘process’ in it, we went another direction. So while we were still cutting other spots, and Erin was about to head out to the shoot of the giant logo with Variable, Brian and I were tackling the print ad/key art. As I mentioned earlier, we did not do a shoot with the characters themselves – we had to rely on production stills from the show. That can sometimes be a dodgy situation – very often these production deliverables are shot quickly, and sometimes not by a professional photographer – they’re intended for uses other than big billboards or key art, and you often don’t have much to work with or very many choices. But in the spirit of the show, we wanted to use what we did have, and find a way to make it work. It wasn’t exactly creating a “paradise out of garbage” but it would certainly be more challenging than if we’d shot with our principal characters. Cold Open set out sketching, and delivered a huge variety of concepts. Since the characters aren’t yet known, while we did want to feature them, we knew we didn’t have to make them the sole focus. Sketch concepts explored the outdoors, the idea of living free, the tools, the characters, and the resourcefulness required to live this way. Ultimately, we settled in on creating a montage of images. An initial concept (to the right) had shown multiple images comped together, and a mood board of images they’d submitted were very arresting and provocative. It would be the best way to use the limited resources and unit photography we had, to feature multiple cast members engaged in their daily struggles and challenges, and showcase the various environments they lived in. And going back to takeaway #1, bringing in the powerful script was another way to bring the campaign together, and the idea of living with purpose. So in a first for us, we put the entire promo script IN the key art – what better way to communicate what the show was about than to echo those same words in the artwork? Cold Open mocked up several different ways to lay out the text that felt organic and natural to the concept. The lines appear to be written as if it might have been carved or spoken by the characters from the show. And they used a variety of color treatments and sizes of imagery to keep it feeling organized but not rigidly so. In the end, it evokes a mood more than a literal interpretation of the show, a textural feeling that the show perfectly delivers on. Montage concept for key art – we modified this idea with more clean lines for our final version. TAKEAWAY #3: MAKE THE LOGO BIGGER! 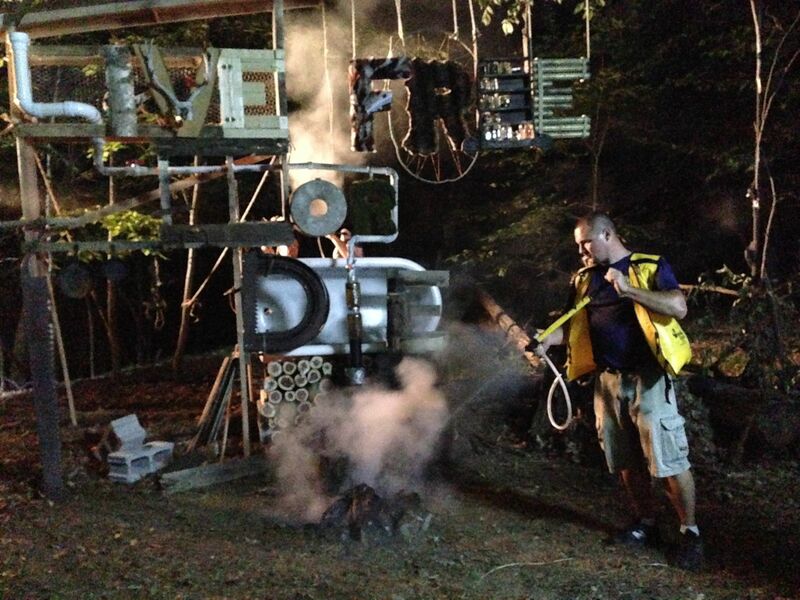 1st AD Alex Friedman supervises the Fire and Rescue team. Safety first! Photo by Erin Newsome. The plan was to use the logo as our final end card – with the initial idea of creating a spot showing someone (a faceless character) building it with their own two hands, culminating in the final big reveal. Variable was excited and jumped in with both feet. Erin went to the shoot, and they spent the day building the logo, and shooting multiple macros of starting fires, chopping wood, and tying rope. 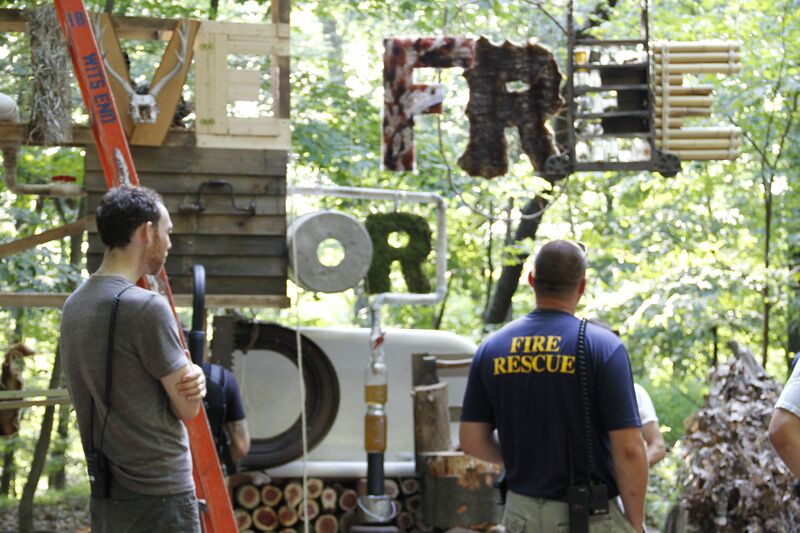 A huge shout out to the team that assembled the logo, which featured fire, chicken coops, a bathtub and dozens of natural, handmade elements and textures. Here’s the final tease, shot completely by the team at Variable, and edited by Ultrabland. THE FINAL PIECES TO THE CAMPAIGN. Ultrabland had delivered some fantastic edits, the shoot was wrapped up, but there was one more piece to the campaign that is always one of the more fun ones. Usually, we deal in :30 promos, and even shorter lengths – but for our biggest campaigns like this, we also do a :45 spot that looks for another way to tell the story to our viewers on our own air (as opposed to as part of a paid media buy on other channels). We use those :45 spots to try other approaches, and not say the exact same thing as the :30, just longer. An early edit concept from Ultrabland had piqued our interest, and it seemed like the perfect idea that would work far better as a :45 than as a :30. Using lots of natural sound, and the perfect track of music, it captured the show vibe perfectly. Additionally, the team at Charlie Co. did a great job using plates that Variable shot, and adding a few subtle elements like sparks and dust into the text cards to enhance the mood even more. Nothing says “that’s a wrap” like a fire extinguisher. Photo by: Yep, Erin Newsome. This campaign was big, and complex, with many moving parts. Many of those moving parts and potential for disconnections was due to how we decided to operate. Between Ultrabland, Variable, Charlie Co., and Cold Open – there could have easily been challenges between so many different creative partners – not to mention the team at Nat Geo. But because everyone was clear on the objectives and we all shared not only a common view on how to promote it but also a love for the show itself – we were able to be crystal clear to all of our partners on exactly what we wanted to create and communicate. That clarity, and a whole lot of communication with everyone on a regular basis turned out a campaign I’m really proud of for a show I’m excited about. More moving pieces don’t necessarily add up to more confusion when everyone’s orienting with the same map. Thanks to everyone on all of the teams for making their “part” as strong as it could be. Truly a case of the strength of the sum of some fantastic parts. This is super insightful, thanks for posting! Love the print campaign. I somehow ended up here after a Google search for the Nat Geo show Live Free or Die. I know nothing about promoting a tv show (I’m a car insurance claims adjuster). But, I know an awesome show when I see one and this is it! It’s refreshing to see a ‘reality’ type show that is actually reality. So many of them are obviously staged and cheesy. This is legit and it’s awesome! Thanks for a great job and I can’t wait to see the rest of the episodes! Thanks so much! Glad you found it and enjoyed it.